So much was happening in Shawna’s life then. The war had ended, her father was home, the family was in a new city, and she had just graduated from sixth grade. She was starting to draw an allowance, and better still, had gotten permission to go by herself to the zoo. Shawna liked animals and thought she might become a vet someday; she and her parents had visited the zoo in their old city a dozen times. Her trip to the new city zoo was a letdown. It was very hot that day and her light cotton dress did little to keep her cool. Worse, the zoo was old and poorly funded, and some of the animals looked sickly enough to be put down. After wandering the grounds for twenty minutes, Shawna knew she wouldn’t visit this particular zoo ever again. She remembered a refreshment stand near the main gate and decided she had time to drink a bottle of grape soda before the next bus arrived. On her way back to the main gate, Shawna saw a family of chimpanzees in an old-fashioned galvanized steel cage and went to the railing for a closer look. 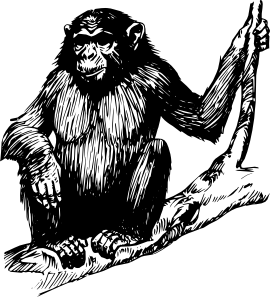 There were three chimps: a male with grizzled whiskers and a younger female both sitting on the seamed steel floor, and a half-grown chimp dangling from a rope. That rope and three others strung from the ceiling panel were the only features in the cage; in back of the cage was a walled enclosure with a square opening above the floor. The chimps were barely moving and seemed oblivious to the humans outside the bars. Shawna wondered if there were any lights inside the enclosure or anything for the chimps to play with. She wondered how the steel floor felt to their bare feet and knuckles, and what they ate, and what they did when it got very cold, and how it sounded when rain fell hard on the steel roof. Shawna started reading a placard attached to the railing and saw that the zoo was planning a new home for the chimps. It was a recreated habitat like the ones already built for a few of the other large animals. The color drawing impressed Shawna. If it told the truth, the new habitat would be big enough for ten chimps and would have trees, forest turf, a pond, privacy caves—everything Shawna imagined a chimp could want. But the zoo couldn’t pay for it and they were requesting donations. Shawna had already spent most of her allowance. She knew exactly what was left in her pocketbook: a dime, a penny, a bus token to get her home. Grape soda cost a dime and Shawna knew that too. She had gotten very parched, and she missed the sensation of cold, sweet, fizzing Concord grapes filling her mouth. The railing post beside the placard was hollow and had a coin slot near the top. Shawna took another look at the chimps in the cage; they still looked numb and paid her no attention. She looked at her wristwatch and opened her pocketbook. She waited for the faint, dull clink of the penny dropping to the bottom of the post before she jogged off to the main gate. Sixty-five years later, Shawna has forgotten the location of her parents’ graves, the veterinary college she attended, and the names of all of her grandchildren—but not one detail of that afternoon. Robert Laughlin lives in Chico, California, in a Craftsman bungalow that deserves the attention of a well-heeled future owner. His story, “Solly’s Portion,” appeared in The Molotov Cocktail Issue 12.